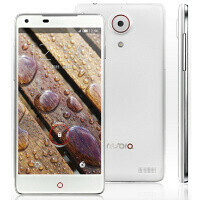 The ZTE Nubia Z5 has leaked here and there, and by now the device is far from being a secret. Still, there is nothing like an official unveiling and confirmation of the beastly 5-inch 1080p smartphone by Chinese ZTE, and we’ve got just that today. The ZTE Nubia Z5 is a device that stands its ground against heavyweights like the HTC Droid DNA, yet it is less expensive. And it’s forming to be one of many awesome new devices coming from China. Another phone maker, Oppo is bringing its similarly high-end Find 5 even outside of Asia. As to the Nubia Z5, it will launch in China in January 2013, but it still remains to be seen whether it will make it outside Asia. All of that is packaged into a relatively lightweight 126 gram device. The smartphone will also be just as thin as the iPhone 5 at 7.6 mm. All of that comes for an off contract price of around $555. Juicy, isn’t it? All specs aside...3,000 mAh battery makes me feel happy about it...thanks ZTE for recognizing user concern for better battery life. Sadly, it's a mistake on our part. In reality, the battery is 2,300mAh. If it has removable battery and removable storage ill be impressed, but if it doesnt then a power user won't get threw the day with out charging this once or twice. I have a note 2 and I get about 3/4th of a day out of mine with heavy use (and I have tweaked the settings on mine so it doesn't leach data). Specs Page says NO microSD. And NO GPS? A 13MP camera without auto focus... Why? This is the kind of omission that can mean the difference between piddling along and a successful launch. Probably the omission of auto focus was due to design compromise. The experienced players (just some that immediately come to mind : Apple, HTC, Nokia, Sammy) know that autofocus is a must have feature. IMO, this is a learning experience for ZTE. Hopefully v. 2.0 improves their offering. lenovo already have a 5" phone. i think the model number is K860. although the specs are not the same but the screen is very good. Look's like HTC's hotter cousin. I was so happy to see it has 3000 mAh and then saw the correction. But it is still pretty decent size battery. However, we all want big battery!! I really can careless about the thickness of the phone. I put case on HTC One X and I still think it's thin. Please make phones a bit thicker with much bigger battery :D I will pay $100 extra on contract just to get a phone with battery 4000mAh or bigger. Ditto, still think they've a lot to learn, they're fairly new to the top end range of phones so still need some time before they can compete with Apple/Samsung/HTC/Nokia etc but they're getting there. 2 things not mentioned in the article.. I camera although it's 13mp has NO auto focus. Also the phone has no gps capabilities not like it doesn't have the apps it doesn't have the hardware.. How the he'll do you release a phone in 2013 as a flagship and not have gps.. Do those retards realize how many options they just cut off at the knees. This isn't their flagship, ironically they've another 5 inch 1080p display and i can't tell whether this is their run of the mill top end. I am impressed by all the specs and it doesn't look half bad neither but I really think high end power house phones with those specs should have a beastly 3000+ mAh battery. My Note 2 lasts like twice as long as my SGS3 did.